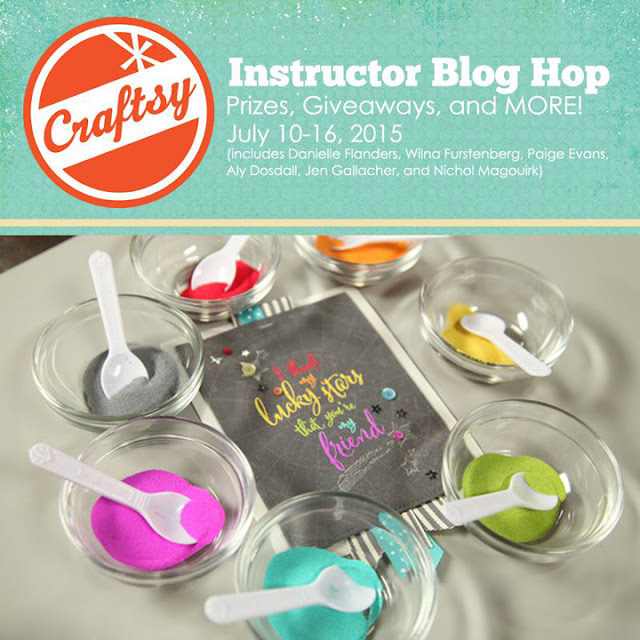 Welcome to a special blog hop hosted by a few of the instructors at Craftsy - an online classroom platform that includes classes on scrapbooking, card making, paper crafting, and much more! Spend a little time getting to know each instructor in this hop and the classes they teach through Craftsy. You'll discover that some of your favorite teachers are now offering classes through this incredible platform. AND look for special giveaways from the instructors! Then join us on Craftsy for inspiring new ways to craft and learn! 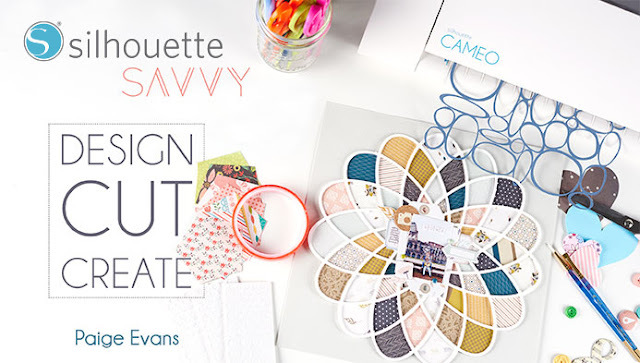 I currently have two classes at Craftsy: PATTERNED PAPER PLAY and SILHOUETTE SAVVY. 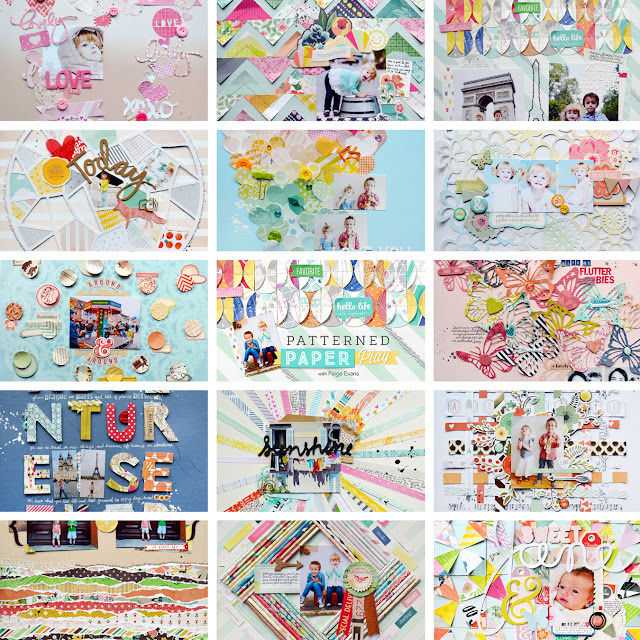 PATTERNED PAPER PLAY includes 7 HD video lessons (with 20+ minutes of content in each lesson!) with anytime, anywhere access. 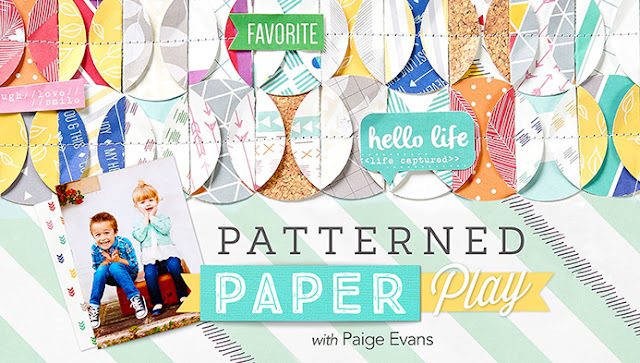 Here's the official class description: Learn stash-busting secrets for playful patterned pages that amaze, all with guidance from designer and renowned instructor Paige Evans. Discover techniques for artfully tearing and layering paper strips for richly textured pages, create custom, intricate cutouts using your electronic cutting machine and learn both hand- and machine-stitching methods for one-of-a-kind results. Then, explore beautiful backgrounds as you master a variety of cutting techniques, layer your paper for a stylish ombré effect, and even roll out paper strips to mat or frame favorite photos. Plus, use watercolors to create the paper you've always dreamed of and play with tone-on-tone backgrounds using spray mist and a doily for imaginative, eye-catching results! Check out PATTERNED PAPER PLAY today! In SILHOUETTE SAVVY I ask - is your Silhouette still sitting in the box? Or are you looking for some new techniques and ways to use your beloved Cameo? From beginning functions to sophisticated techniques, I'll be there every step of the way showing you exactly how to create amazing layouts in 7 HD lessons, over 20 minutes each! Seven (7!) cut files I designed so you can create these layouts are included! Join me in SILHOUETTE SAVVY and learn virtually everything there is to know about your Silhouette! ONE lucky winner will get a FREE spot in BOTH of my classes (PATTERNED PAPER PLAY and SILHOUETTE SAVVY)!!! Just leave a comment on this post and tell me your all-time favorite scrapbook collection, because I'm curious :) I'll randomly pick and announce the winner on Friday July 17th 2015! UPDATED WITH THE WINNER: Congrats Lisa's Creative Niche! Hmmmmmm ... my all time FAVE scrapbook collection -- I would have to say that would be Bo Bunny's "Mama-razzi" collection!! I loved the colors, the vintage cameras, the paper designs!! Just one collection! Uhm.....my minds eye lost&found. Not just the colours and the design, but how that paper feels (a bit heavy)! Love it. I don't scrapbook (I make cards though) but I would love to learn! Thanks so much for the chance to win!! Thanks for the chance to win, I don't know that I could pick just one collection, but I do love Simple Stories Summer Vibes line. Such great colors! It would be a blast to win a spot in your classes! My favorite collection is Crate Paper Open Book from Maggie Holmes. Thanks for the chance to win!! Hi Paige - I have to be one of your biggest fans! Thank you for all of the inspiration you have given me. My favorite collection to date is MME Lost and Found! I am hoarding what is left in my stash. Thank you so very much for a chance to take both classes! My all time favorite scrapbook collection?? Oooh, that's not an easy choice! Since I love autumn oh-so-much, I'm going to choose the Apple Cider collection by Bo Bunny from a few years back. I have a lot of it, and I'm still hoping to get my wedding scrapbooked with those beautiful papers and embellishments. Thank you for the chance to win! One of my fav collections is Pink Paislee's City Side Walks. Paige- I am in your Silhouette class and have loved the ideas you've shared. I would love the chance to win a spot in your Patterned Paper class! Thanks! I scrap digitally (but am moving towards doing paper again-- there is so much I miss about the tactile-ness of physical supplies), but my favorite all time scrapbook collection would have to be the Basic Grey Blitzen collection, tied with October Afternoon's Public Library. My all time favorite collection would have to be Lily Bee Destination. WOW, both classes. I would love to win it. Thanks for a chance. pick one collection??? there is this old cosmo cricket collection I am hording the last of my scraps - Mr. Happy (or something like that). I totally wish I could have more of it. Favorite collection is whatever is the newest on my desk. I would love to win both classes. I hope I am not posting twice. I had trouble remembering my Google password, and then my comment was gone once I got back here. One of my favorite papers was Mama Razi by I believe Bo Bunny. I also have loved papers from Prima, G45, Pink Paislee, October Afternoon, and the list goes on. I love classes! I have learned so much but this one is on my bucket list! Both classes look fantastic but your paper designs are out of this world! I loved October Afternoon so maybe one of their collections.. The rocket one, Out of this world? Wow! Two classes! That is awesome! WOW!! These classes look awesome!! I would LOVE to take that Silhouette class!! Your classes look amazing! Picking a favorite collection is so hard! I think maybe Crate DIY Shop? How awesome!!! I love the American Crafts dear Lizzie lines as well as MME Sweetest Things Collections! Thanks for the chance to win! I love Shimelle's True Stories Collection! Both your classes sound really wonderful! I love Basic Grey's Kioshi collection best of all, but there are definitely tons of great ones out there! Looks fascinating. Thanks for the chance to win a spot in your class. My favorite collection depends on what is on my work table at the time. You are so generous. My all-time favorite collection would be Dear Lizzy POLKA DOT PARTY....I love that one....I never got any of the embellies or the 6x6 pad but I love the papers from the large 12x12 pad. I never remember the names of paper collections. I love anything with lots of aqua, purple or blue. I gravitate toward bright colors and fun themes like summer scenes, sunflowers, geometrics and birds. :) Thanks for the giveaway! My favorite was a collection from stamping up! that had vintage sewing items, but don't remember the name. Would love your silhouette class....I have one, but want to learn more! Thank you for this great option. That's a tough question with all great new releases coming up:) but Teresa Collins vintage finds are an all time favorite. Thanks for the opportunity to win a place. I can't pick a favourite between collections from Shimelle, Amy Tan or Maggie Holmes! Yikes! Hoe could anyone pick a favorite? My Minds Eye Lost and Found, Basic Gray anything Christmasy, the list could go on. But, in truth, it's the newest lines out there. I always "need" the new stuff. I'm a real paper boarder, I need help! Have you been peeking in my window, lol, how did you know my Silhouette was still sitting in the box! I really need this class and I would love to win it, love your samples! WOW! I love this explosion of colours! fascinating projects! Love your style! Thanks for a chance to win! I love all the Crate Paper and Simple Stories collections but I guess my very favorite is Craft Market. Thanks for the opportunity to win. looks like fun, love basic grey! Your classes look amazing and I am a huge fan of your style! My all-time favorite collection would have to be Amy Tan Plus One. Love the bright colors! I generally don't get stacks of 12x12, I love a good scrapbook store with aisles of single sheets so I can pick and choose the ones that catch my eye...I do get stacks of 6x6 for card making and my favorite currently is Pink Paisley solstice. Your layouts are amazing, colorful, full of movement and fabulous. WOW. Thanks for the chance to win! My favorite is "Sketchbook" by Amy Tangerine for American Crafts . I'd love to take your first class. Looks great! I love paper period but if I had to name my favorite it'd be Graphic 45. I would so love to win the chance to see you work your magic with paper, the class looks awesome. Thanks for the chance to win. so many favorites! most recently it is Maggie Holmes Open Book. Ack. Awesome chance. I'm a fan of all things Maggie Holmes, especially that Open Book collection - she killed it. I so need to learn how to use my Silhouette machine...thanks for the chance to win...and 2 classes...yippee!!! I'm a cardmaker, not a scrapbooker, but I guess learning more tricks about getting the most out of your patterned papers is always a good thing. As for my older model Silhouette, it's been put back into the box quite a while ago and could surely do with some more love and attention, Thanks for the chance to win not ine, but two classes. Wow! Pick a favourite?? YIKES!! That would the collection that is on my desk which forever changes but right now it's 365 by Chickaniddy. all time would have to be Pink Paislee's London Market. Still reach for it all the time and bought multiples of it so I could enjoy for a long time. addicted much? lol. Thanks for the chance to win! Difficult to choose one, but MME lost and found is definitely one of the favs! I would love to be in your class, wow! Pretty much love anything Crate Paper puts out. Love your work & hope I win! Oh Paige, that is a tough question....I loved the Fancy Pants Me-ology collection for its colors, graphics, vintage yet contemporary feel. But I also love the J'adore line by Basic Grey especially after seeing what you created with it. I'm pretty obsessed with Basic Grey. My all time favorite collection is Crate paper Craft Market. Hello Paige, I'm Australian so I have to say Kaisercraft paper. The Secret Admirer collection is lovely. Hi Paige! I really get inspired by your posts on Instagram but it would be so awesome to join your classes and learn from you! My favorite collection would have to be Open Book. hmmm, one of my favorites was echo park capture life and well all of amy tan's lines. They both sound like really great classes. I would love to take them both! Just finishing my crafting room.. Have a great layout for all my paper crafts. Put your class on my wishlist. Have mainly been making cards and bookmarks but I needed the workspace expansion so I could start scrapbooking. I'm almost ready to jump in with both feet. Hi, Paige. I love your blog. Thanks for the hopping fun! I would love to win a seat in both your classes. My favorite collection i just finished was Crate paper Journeys and I'm waiting for Simple Stories Summer Vibes to arrive so i can scrap my summer pics. Oh I don't have a favorite yet, I'm just wanting to get going on paper crafting. Your classes sound awesome, especially the Silhouette Savvy class. 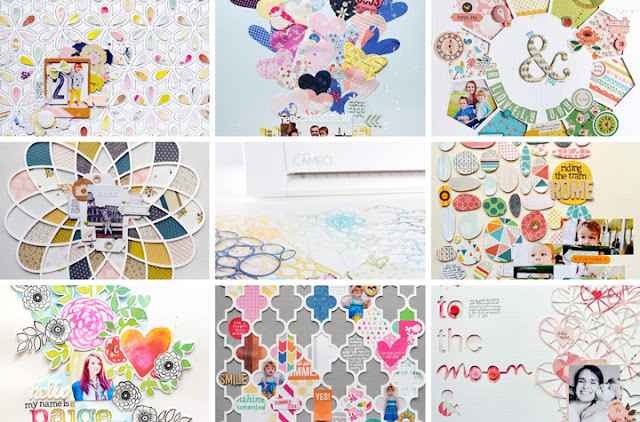 As I'm a paper addict, it would be hard to pick a favorite! Let's just say it would probably include the color teal, and have a variety of print sizes, textures, and hues, along with complementary colors that pop! Would love a spot in one or both of your classes! I have a Cameo that I could use a LOT more than I do. Your classes sound great...would love to win! My favorite collection is anything Basic Grey!! I am a huge fan of G45's Secret Garden collection and have bought multiples of it numerous times! It is so gorgeous!! I have a Silhouette that IS still sitting in the box 3 years after purchasing it! To be honest it scares the bajeebers out of me!! I keep saying I am going ot take the bull by the horn and just do it but fear takes over every time!! Would love to win this class and finally get my Silhouette out of the box and start using it!! Thanks for the chance to conquer my fear!!! I was thrilled when I saw your class, I am really excited for the opportunity to win, thanks.I want to learn your sewing and rolling techniques. You really create amazing things with paper. I like G45's Raining Cats and Dogs. Thanks for the giveaway! Wow 2 classes! I am just getting started with scrapbooking so I don't have a favorite yet. Thank you for the opportunity to win a spot in your classes! I've never scrapbooked, but I would love to learn how! I love playing with paper, I've just never been sure how to start a scrapbook. Thank you for this giveaway! I'm drawn to deep colors with a Asian or nature themes. Either than or I create my own backgrounds with watercolors, inks etc. I don't know if it counts as a collection,but I love reading creative keepsakes and Northridge publishing for ideas. I am interested in the silhouette class as when I took ill my parents donated all my scrapbooking supplies, my two cricuts, my gypsy, everything to a local H.S. after school scrapping club. I wish I had the cricut but the new mchine looks really cool and useable with cards as well. I love girly collections and my current favorite collection is Dear Lizzy Polka Dot Party. Love, love, love the patterned papers, die cuts, and cute little bows. I tend to hoard my paper and need to be better about using and combining patterns.